The Trump presidency has brought big disappointments for those concerned about climate change, but some states are taking action – hoping to reduce the risks that lie ahead. Sandy Hausman reports on how and why Virginia is stepping up. A crew installs solar panels at the University of Virginia. Later this year, Virginia will join 10 other states in what’s known as the Regional Greenhouse Gas Initiative or RGGI – a group committed to cutting the amount of carbon released into the atmosphere by its electric utilities. William Shobe, Director of UVA’s Center for Economic and Policy Studies, says one man made the decision to go in. 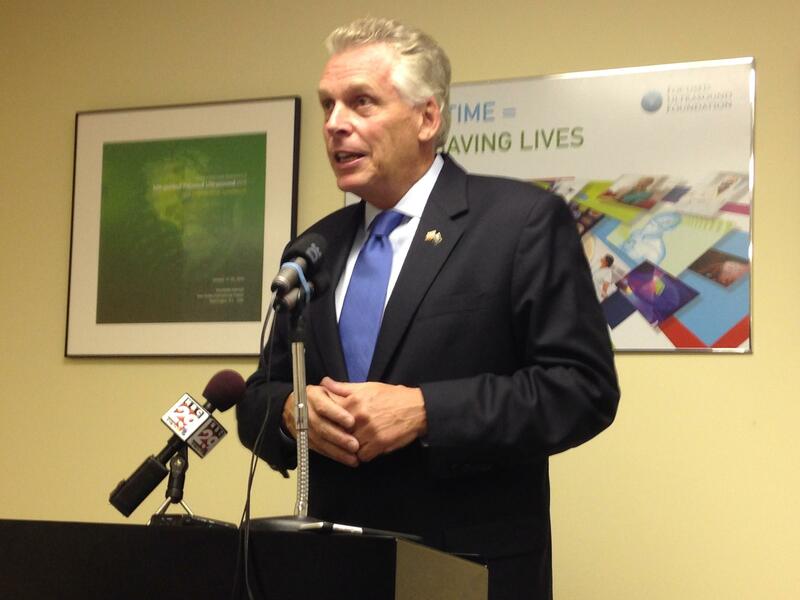 Former Governor Terry McAuliffe committed Virginia to joining RGGI after the state's attorney general said he could legally do so. The program will provide utilities like Dominion and APCO emission allowances equal to 28 million tons of carbon dioxide. It they produce more than that, they’ll need to buy additional allowances from other utilities or face big fines, but if their emissions fall below the cap, leftover allowances can be sold to states having trouble reaching their goals – or stored for future use. Shobe, an international expert on energy markets and the environment, says the cap would put Virginia in compliance with limits established before Donald Trump took office. On first glance, Shobe says, you might be surprised to find Virginia joining Maryland, Connecticut, Vermont and other progressive states in RGGI. "It’s a business-friendly state. It’s a southern state," Shobe explains. But, he says, joining RGGI made perfect sense for a state determined to attract companies and jobs. "A lot of the businesses we’re trying to attract want us to do this. Amazon coming into Northern Virginia is going to want to cover their electricity use with renewable energy. We’re going to be needing to provide renewable energy to keep companies wanting to locate their data centers in Virginia. It’s actually a business-friendly decision on Virginia’s part to join RGGI and to build more renewables." He adds that Republicans in Virginia may find it easier to climb on the environmental bandwagon -- especially those from Hampton Roads. "Lawmakers along the coast are on notice that the coast is ground zero. It is the bull’s eye for climate change effects on Virginia, and there are other effects on the rest of the state – agriculture and other things, but the big, big economic impact is on the coastal region." Shobe thinks Virginia’s decision to join the Regional Greenhouse Gas Initiative may inspire other purple states like New Mexico, Colorado and Minnesota, and he notes that similar cap and trade programs have been successful in the past. "The first one was implemented to reduce acid rain, which was caused by the sulfur dioxide emissions from coal-fired power plants, and that was done with a cap and trade program that was hugely successful." The second began in 1994, cutting nitrogen oxide pollution that was causing serious health problems and reduced productivity. Both programs were implemented with little opposition, and the result was cleaner air and improved health at a very low price. Virginia’s House of Delegates approved a bill to keep this state out of RGGI, but Governor Northam – a native of the Eastern Shore – has vowed to veto it.